If you’ve driven on the motorways of Europe you’ll almost certainly have seen lorries from the Spanish province of Almería delivering fruit and vegetables to every corner of the continent. Thanks to intensive agricultural production carried out an all year round in enormous plastic greenhouses the region has enjoyed a booming local economy. Added to this is the income generated by the tourism sector which is focused on a number of popular holiday resorts along the region’s Mediterranean coastline such as Roquetas de Mar and Mojácar. The arrival of cruise ships in the Port of Almería is a new string in the city’s bow with approximately 30,000 passengers visiting the city last year. Cruise ships arrive at the Muelle de Levante which is just 1km from the city centre. 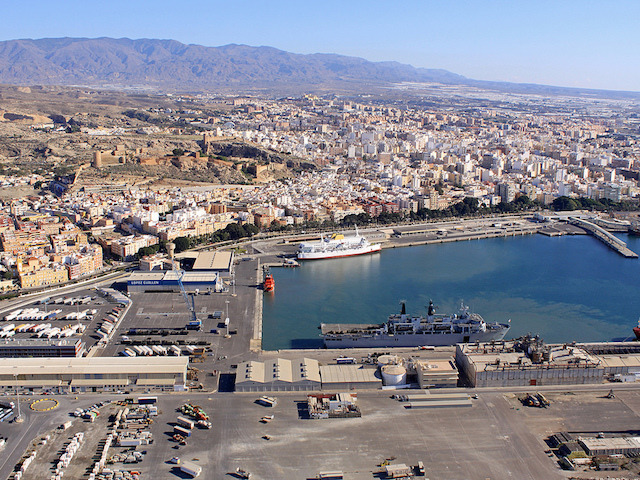 The port area also deals with ferry traffic operating between Almería and destinations in Morocco and Algeria. Once you arrive in the Port of Almería there’s no need for any transport as it’s only a short stroll into the centre. Just look out for the blue line on the footpath as you walk out of the port area as this leads cruise ship passengers into the old town. To help get your bearings it’s well worthwhile picking up a city map at the Andalucía Tourist Office (Parque Nicolás Salmerón) in the park just opposite the port or in the Municipal Tourist Office of Almería (Plaza de la Constitución) in the city centre. Or to make life even easier you can download maps from the official Almería tourism website. A novel way to get around is to jump on the trolley train which collects tourists at the port exit then takes them on a one hour tour through some of the city’s main streets. Alcazaba: Almería’s Moorish Citadel is the city’s main attraction which is visible to the north-west as your ship approaches the port. Its construction dates back to the 10th century when it was built under the rule of Abd-ar-Rahman III under the rule of the Caliphate of Córdoba until the Christians took control in 1489. 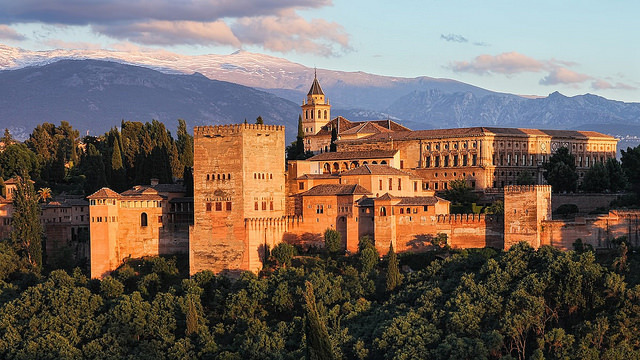 Of all the fortresses in Al-Andalus (Moorish Spain), only the Alhambra Palace in Granada is larger yet Almería’s Alcazaba is relatively unknown on the tourist circuit. Cruise ship passengers can walk from the port for approximately 2.5km through the old town to get there otherwise you can take a taxi from the port’s exit to get there. The walk up the steps from the entrance may prove a little challenging to some visitors though well worth it when you see the stunning views at the top. Appropriate shoes are recommended for walking on the cobbled stones. Castillo de San Cristobal: Standing on a hill to the north-east of the Alcazaba are the ruins of this castle which once served as a fortress under Moorish rule. Today it is little more than a reminder of the city’s military history from where visitors can get great views over the city towards the port. 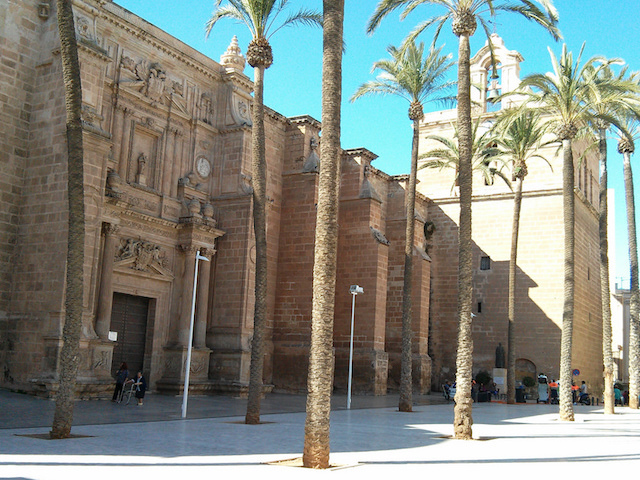 Catedral de Almería: Located in the old town, the city’s cathedral is remarkable for its fortress-like appearance. Such a defensive structure was constructed to provide a safe haven for the populace during attacks by pirates. The site was originally occupied by a mosque before being consecrated as a Catholic church after the Christian reconquest. It was destroyed by the earthquake of 1522 before being reconstructed in Gothic and Renaissance during the 16th century. Museo Refugio de la Guerra Civil (Plaza Manuel Pérez García, 1): The atrocities committed at Guernica in the Basque Country have been well document yet so little is mentioned about the attacks on Almería, Alicante and Cartagena during the Spanish Civil War. In May 1937 a German battleship docked offshore shelled the city killing and wounding civilians as well as destroying many buildings. To protect the population against future attacks a network of bomb shelters were constructed which could shelter as many as 40,000 people. The tunnels located beneath Paseo de Almería have been renovated and opened to the public in this interesting museum. Museum of Almería (Carretera de Ronda, 91): Whilst there are a number of interesting museum scattered around the city this archeological museum is the stand out attraction. Throughout the course of history Almería has been occupied by the Phoenicians, Carthaginians, Romans and the Moors, a story which is brought to life by the exhibits on display in this museum. Mercado Central (Calle Circunvalación Ulpiano Díaz, 14): This historic structure located near La Puerta de Purchena to the north of Paseo de Almería has served as the city’s main market place since it opened its doors in the 1890s. Even if you’re not planning on doing any shopping it’s well worth a visit just to wander around the many stalls selling fruit, vegetables and seafood. The area around the market is a good place to enjoy lunch at one of the local tapas bars. 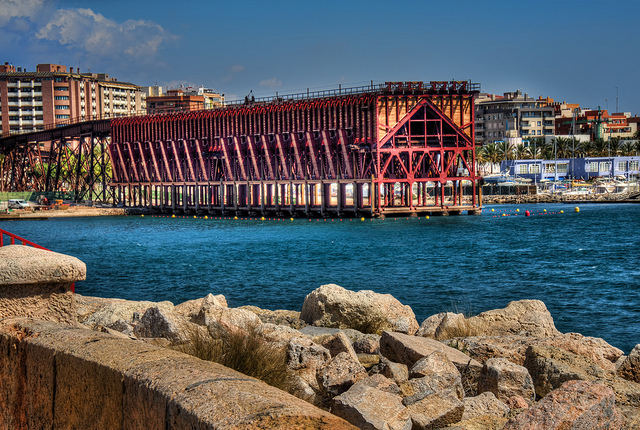 Cable Inglés: This amazing fete of engineering which lies just east of the port was once used to load iron ore mined inland directly onto ships from the trains on which it was transported. Alhambra Palace: The Alhambra Palace in Granada is a UNESCO World Heritage Site and one of Spain’s most important tourist destinations attracting more than 2.5 million visitors per year. Under Moorish rule this palace-fortress became home to the Nasrid Dynasty during the 13th and 14th centuries. A visit to the Alhambra Palace (which lies 170km to the north-east) is by far the most popular shore excursion from the Port of Almería. The journey takes around two hours each way so you’ll need to book an official shore excursion with your cruise company or a private operator as it takes too long by public transport. If your cruise ship is also due to stop in Málaga you could take a shore excursion from there instead though you’ll find more to do in Málaga itself than you will in Almería. 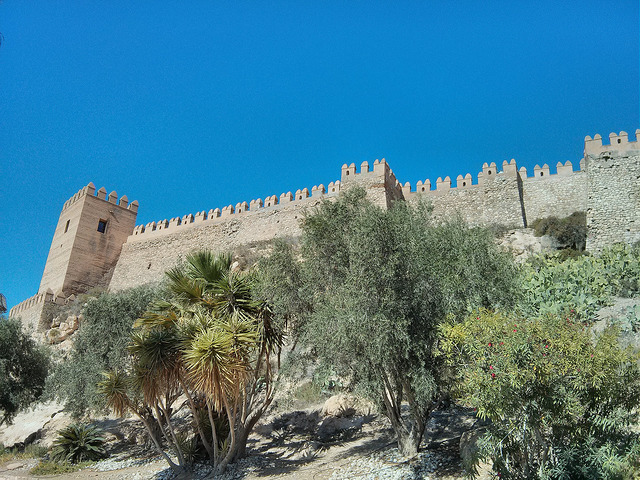 If you decide to spend the day in Almería rather than visiting the Alhambra you will get a taste of Moorish architecture but the city’s Alcazaba isn’t anywhere near as impressive as the palace-fortress in Granada. In fact, Almería’s Citadel was destroyed by an earthquake in 1522 and leaving it in ruins until reconstruction work began three centuries later. 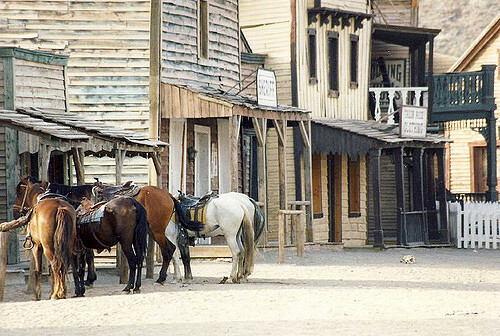 Mini-Hollywood: For a fun trip which is less than 50km from Almería you can head north into the Tabernas Desert. Here you’ll find three small theme parks (Oasys, Western Leone and Fort Bravo) with a Western theme. More commonly known as ‘Mini-Hollywood’ this region’s arid landscapes has long attracted film makers including Sergio Leone who filmed a number of spaghetti westerns here including ‘A Fistful of Dollars’ (1964) starring Clint Eastwood. Scenes from Lawrence of Arabia (1962) and Indian Jones and the Last Crusade (1989) were also shot here. Half-day excursions are usually available with cruise lines otherwise the city taxis at the port entrance will take you there. Cabo de Gata: Just 30km south-east of the port along the coast is the largely undeveloped Cabo de Gata-Nijar Nature Park. With some quite unique landscapes of volcanic origin and a number of beautiful beaches this is a popular destination for hiking, camping and birdwatching. Visitors from cruise ships would be best advised to hire a private guide and driver to see this fairly isolated region as public transport wouldn’t be an option with so few hours in port. Almería Airport: Almería has an international airport which lies just 9km east of the city centre. There’s an Airport Bus (No. 20) between the airport and the city as well as taxi and private transfer services. Almería Hotels: Take a look at Booking.com for a selection of good deals on hotels in Almería.